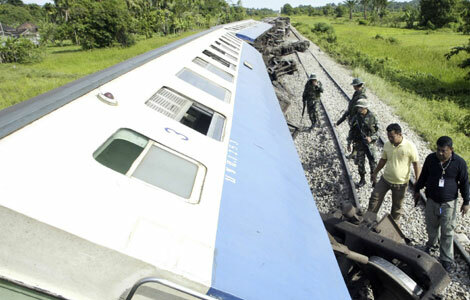 A passenger train derailed Monday in southern Thailand after saboteurs loosened a section of track. A three-meter section of rails was unscrewed, sending the northbound train off the tracks. Local officials suspect that Muslim rebels were responsible. The train, carrying about 200 passengers, derailed about 750 kilometers south of Bangkok in Pattani province's Kok Pho district.